Marceline Vandewater invited me to give a talk about insects and a black-light presentation at the Boyce Thompson Arboretum (BTA) in Superior, AZ. Macro-photographer Paul Landau opened the program with a show of his beautiful insect photos. The attendance was such that only half of the crowd could fit into the lecture room at a time. Terry Stone took a video - I hope this will link to it. But for me, the greatest finds were not insects but two beautiful snakes that were found close to the black light. I only saw them after they were already captured, so my photos are not of the 'in situ' kind that I like best. The snakes were actually rather agitated and trying to escape.... But both species were 'lifers' for me, at least in the wild. The stout little Sandsnake was a great find, but the Coralsnake was even better. I can see why kids would be found playing with this dangerous little beauty. It may have the poison of a cobra, but it has the charm of living jewelry. We did handle it carefully to keep it in photo range. It did not even threaten to bite. There is of course the way our former neighbor chose: with his .22. When I commented: "too bad that you are so afraid of them" He replied - "Oh, I'm fine with snakes, they take care of the darn packrats - but you know, the wife..."
No photos of those calamities here, for sure. But some of my own older photos also bug me in hindsight: they show the snake in an impressive pose, reminding of a cobra ready to strike. The one above I have used over and over. 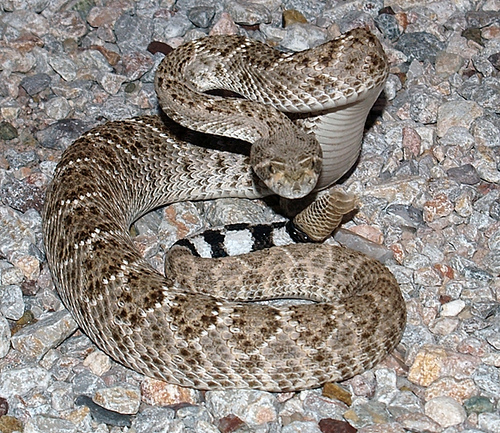 Those photos portray our Western Diamondback as something he really isn't: aggressive and dangerous. In fact it took four dogs barking their hearts out and me with my snake stick (and terrified for the dogs) to make him that angry. I'm happy to say that it is an old picture. 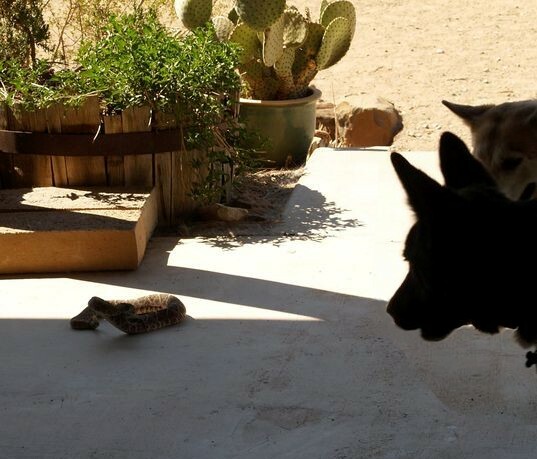 Our male dogs' hysterical reaction to snakes forces us to capture and move some snakes that make a straight line for the row of dog beds on our patio. I used to take pictures - hoping to use them for identification of repeat appearances. Even with more reliable methods (paint marks on the base of the rattle) we found very few. 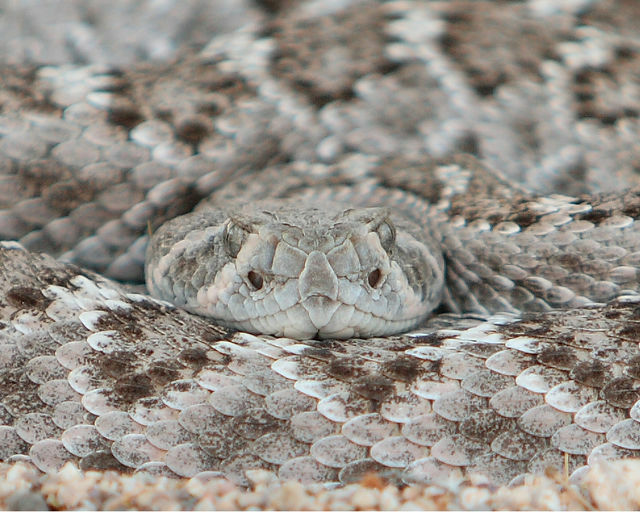 Experienced herpers tell me that snakes have a strong aversion to human smell and remember and avoid locations of traumatic experiences. I still believe that moving them about 500 m north simply offsets the route of their annual east west migration across our property enough to make them miss the patio. Anyway, those pics are purely utilitarian. There is a type of esthetic, well composed pictures appearing in all kinds of publications: The snake is looped decoratively in a natural setting, and since snakes have no discernible facial expression for grumpiness the pictures look fine at the first glance. The snake's pose tells me that an expert snake wrangler was involved. By now I have witnessed that kind of 'gentle directing' too often to appreciate the results any more than 'natural background' pictures of insects that are posed on a green leaf held by a clasp on a tripod or placed on a nice neutral rock in perfect light: they may be more pleasing than bugs on a dirty white black lighting sheet, but they are hardly more natural (a little deceiving sometimes, though). There are very good photos taken in displays terraria where snakes have been kept successfully for years. These exhibits do a great service by safely introducing the public to the beauty of snake and hopefully convince the visitors that the reptiles are worth their respect and protection. The photos portray usually calm, content snakes as well as the artistry of the terrarium designer but there should be no pretense that we are seeing a natural setting. By far my favorites are the photos of undisturbed snakes in their natural habitat (or what the snakes claim as their habitat, like nice cool patios). They are sometimes awkward because of the snake's elongate body shape and they often have to be shot through shrubbery and brush. 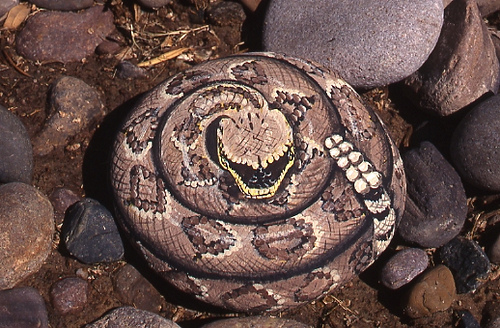 But they provide information beyond just the fact that a certain snake species was seen by the photographer. They tell of the snake's behavior and preferences and of the photographer's patients and observation skills - and often - luck. 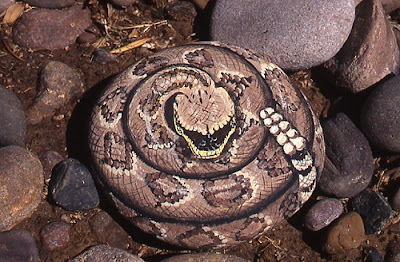 Different from mammals and birds, snakes are heterotherm: Their body temperature depends on the temperature of the environment and they have only behavioral means to regulate it. 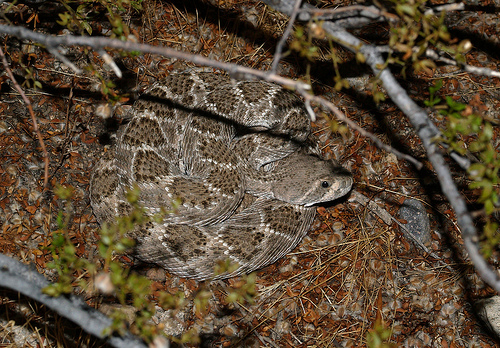 For rattlers in Arizona this means to be mostly hidden and inactive in winter, day active in spring and fall and night active during the hottest time of the year. This one rested at night close to my black light. 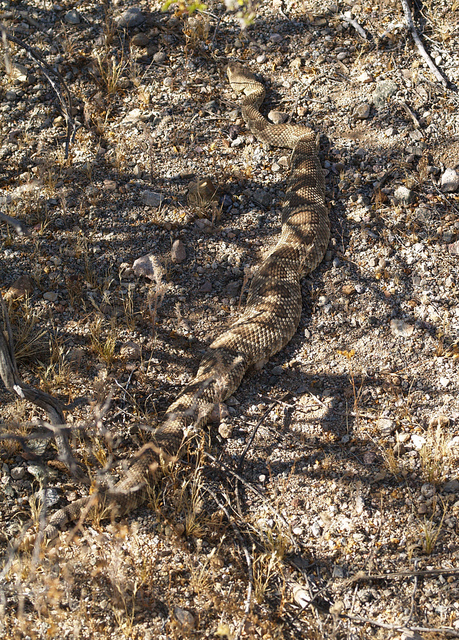 I passed him again and again before he gave his rattle a warning little shake that I first mistook for the call of a Desert Clicker Grasshopper. Notice the dilated pupils. Cool desert nights are spent tightly curled and snuggled into the warm sand. The snakes keep such a low profile and lay so quietly that I usually discover them after stepping over them or when watchful quail coveys betray them in the early morning. Check out the pupil in the night time photo: it's dilated like our own in the dark. In the morning the snakes stretch out under the first warming rays of the sun. Not having a breast bone, they are able to spread their ribs and flatten their bodies to expose as large a surface area as possible. In this position the are less photogenic, but the shot shows that the photographer didn't disturb the snake's normal behavior. 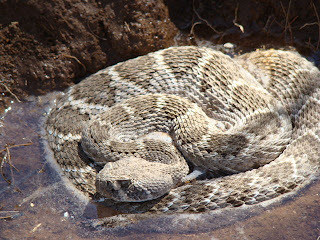 Bathing rattler, Photo by Jimmi S.
Of course it can also be too warm here in Arizona, and most snakes seem to cool off in the shade or even under ground. But if you have birdbaths or flat ponds around, you can also observe another thermoregulatiory behavior: the dip in the pool. 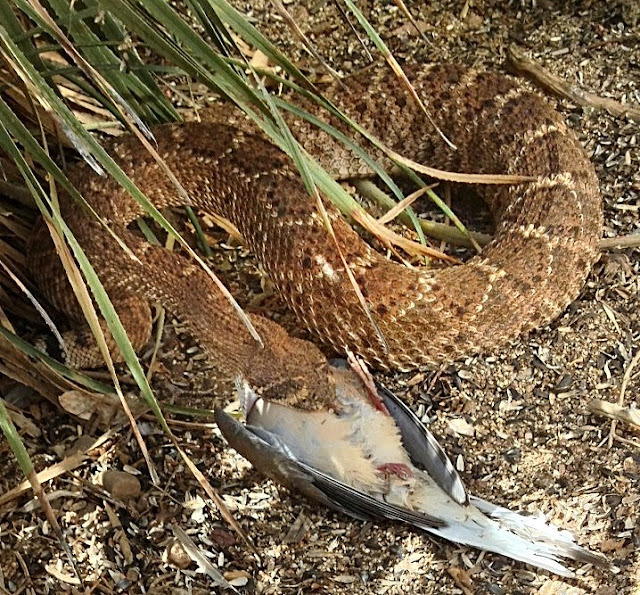 I see Gopher Snakes do this more often than rattlers. Undisturbed snakes provide many great photo opportunities: My friend CJ Vincent made his 3 acre property in between Tucson and Catalina into a beautiful nature preserve (WOW Arizona! open to the public by appointment). He is so comfortable (and on a first name basis) with the local resident rattlers that he can observe them hunting and feeding. 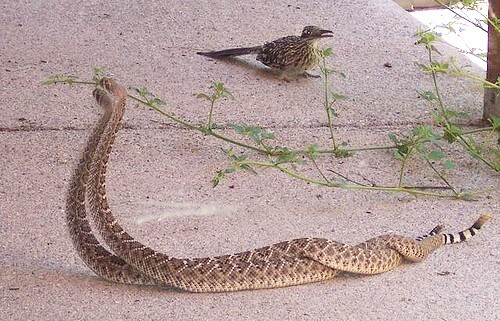 This photo of competing male rattlers was posted years ago to the photo gallery of the AZ Star. I down loaded it to my computer long before I started posting on the internet, writing a blog or thinking much about copyright. So if you should be the photographer - I went through the whole wildlife section of the gallery without finding your name - please contact me! Sometimes a well chosen detail is more impressive or informative than a full body shot. And then there are the shots that aren't so great, but they come with a personal story dripping with emotion or in this case adrenaline: Last month I was giving a talk at Southwest Wings about Sphinx Moths' attraction to Datura flowers. So at night at Pat Sullivan's place in Ramsey Canyon I was sitting next to a beautifully blooming Datura plant to shoot some last photos. I heard a 'swishhh' and saw the brown and yellow pattern of a snake gliding through the grass very close to my thigh. 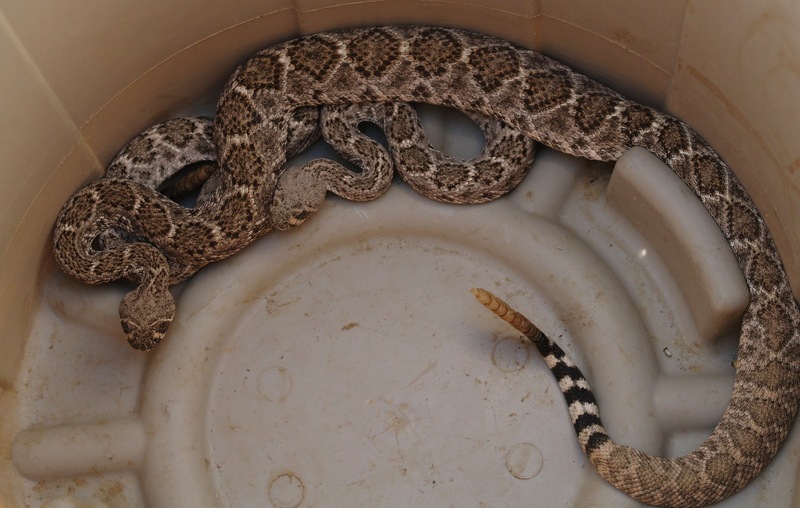 I had been playing with a huge tame Gopher Snake that afternoon. This snake seemed as long and had similar colors - making me think that this was a Gopher as well. So I kept shooting my moths and actually talked to the snake (hey, we were both lonely and no one could hear us). I nearly reached out to touch it. 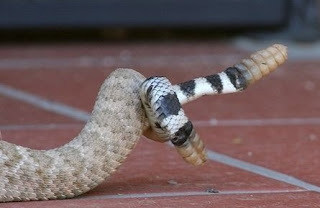 The snake's head rose above the grass like a telescope, looked at me, then pointed into the Datura, withdrew, came back into view...and suddenly appeared awfully big and triangular...not a Gopher, but an unusually long Black-Tail Rattlesnake. Since I was weighed down by two cameras, collecting pack and flash light, there was no way to scramble away quietly. So I stayed and instead took some pictures that suffered somewhat from being too close. Those are always the best ones - in my mind at least. And who says that they have to be photographs, anyway? This painted rock once made a woman leave my art booth: 'I know it's not real but I can't stand to be near it'. Can't please them all. It sold for a good price to someone else. Some Batesian mimicry works well on me. 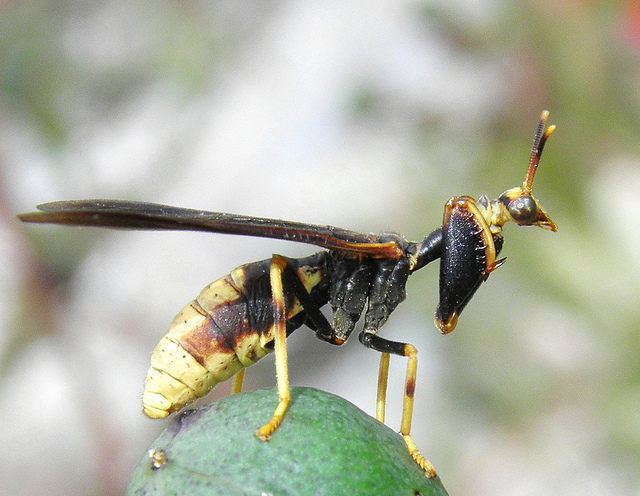 Whenever I see a harmless (to me) mantispid in the exact colors of our most common paper wasp Polistes comanchus I am instictively careful of a powerful stinger - which the mantispid, a relative of ant lions, just doesn't carry. 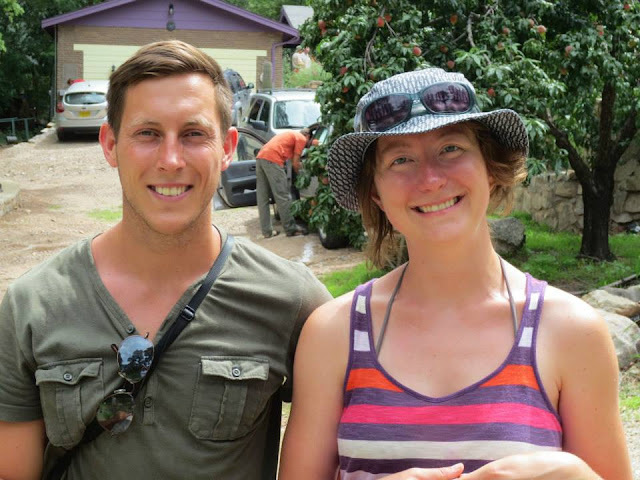 On Tuesday I took Caroline and Martin, two young German scientists, into the field to look for this paper wasp mimic, the Mantispid Climaciella brunnea. I had found one last week in Madera Canyon on Desert Broom during the day, but Peppersauce Canyon on the north side of the Catalina Mountains (Pinal County, Arizona) is the only place where I knew them to show up reliably at the black light. 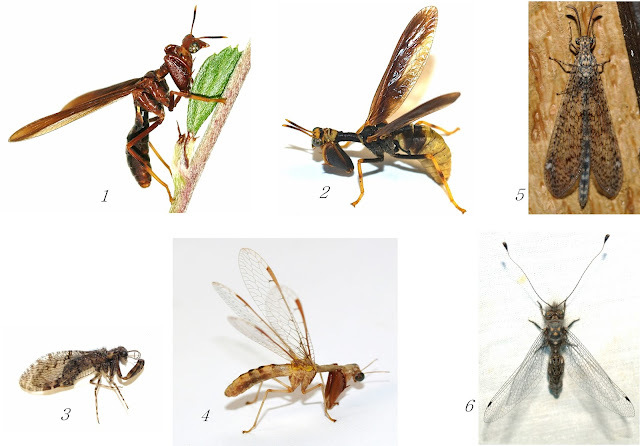 1 and 2 Climaciella brunnea, 3 Plega sp., 4 Mantispa sp., 5 Ant Lion Brachynemurus sp, 6 Owlfly Ululodes sp. We really got one single specimen, but at least it was a different color morph than the one from Madera Canyon. We also got many more interesting Neuropterans - other mantispids like Plega and Mantispa and many ant lions and an owlfly. Peppersauce Canyon is one of my favorite collecting places and it lived up to my expectations. There were no other people except one Jeep driver slowly negotiating the rocky road, but lots of impressive insects. Caroline and Martine braved the onslaught and coughed through a mist of dislodged moth scales, but I left to rather investigate the surroundings. There is an old oak tree in a clearing that is bleeding sweet fermenting juice from many scars. 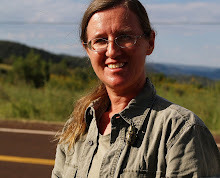 When we first arrived we saw so many yellow jackets on the bark that Caroline mistook the location for a nest entrance. Now the still warm night air seemed loaded with the heavy yeasty fragrance of a brewery. Ants, beetles, moths and roaches were competing for room at the source of the fermenting juice. Big longhorn beetles rustling and chewing, click beetles pushing their way in, carpenter ants forcing ants of a smaller more agile species out of the way. Even small, delicate moths claimed their spots against the sturdier beetles, their eye-shine eerily flashing back to my head light. After a while a larger Underwing moth joined the feast. During the day these moths sleep on the bark of trees where they are extremely hard to spot due to their camouflage pattern. While fighting for its place at the seeping tree juice the moth showed its colors, aggressively flashing its wings at beetles and roaches. Then a huge dark shadow interrupted the beam of my flashlight. I thought a bat was swooping in to grab one of the intoxicated insects that showed neither fear nor caution. But the shadow descended - landed - and turned out to be a moth as well: a huge Black Witch. It was much larger than the big silk moths that we'd seen earlier. It's wingspan exceeded the length of my hand which is 6.5 inches. This witch was very tattered and old - telling a story of narrow escapes from bats and birds and survived monsoon storms. These moths were long believed to be all border crossers from Mexico, but by now freshly emerged specimens are found far north of the border, proving that many Black Witches are legal - born US citizens. 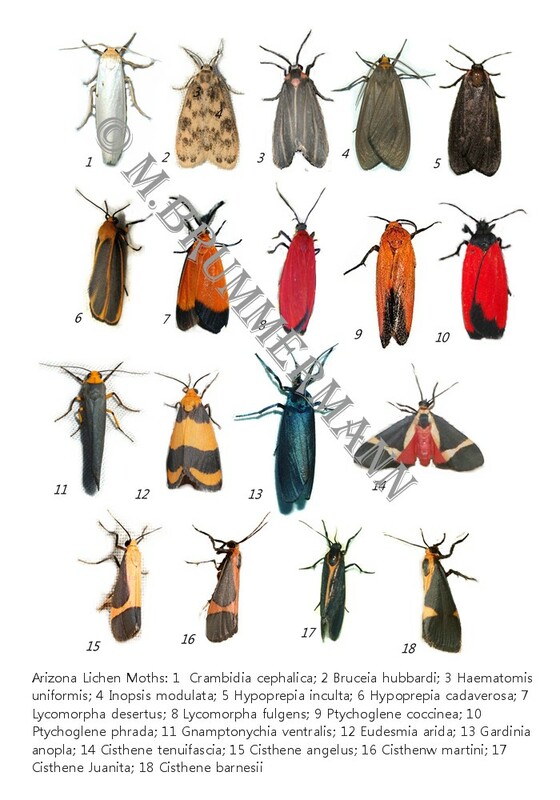 (A word to explain 'Nuns' of the title: when I was a kid in Germany, we called Underwing Moths 'Nonne' - 'nun' in English - though the official name for the genus is Ordensband (after the colorful sash worn by ordained Catholics). I think my friends from Berlin were as happy with their mantispid catch as I with my observations in the dark and mysterious forest. Our BugGuide Gathering was registered as an event of the National Moth week, and the species count was quite overwhelming. I am still editing hundreds of photos. 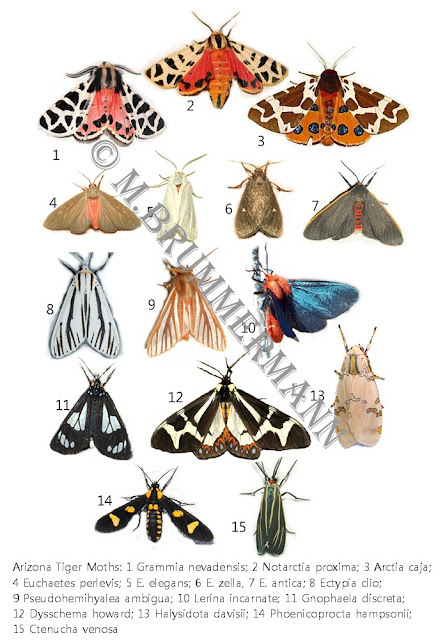 Some of my upcoming events will also focus on moths. 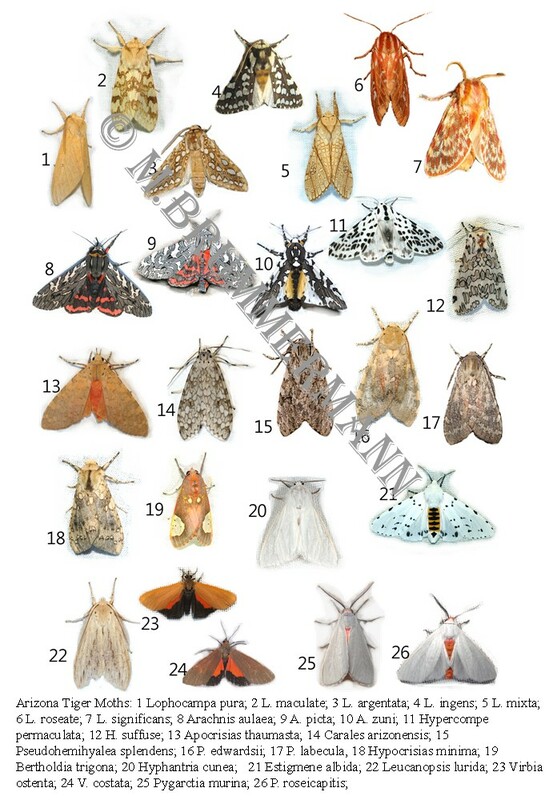 There are thousands of species, and most have no common names, so I would have to memorize the scientific ones. Even though I usually defend our use of those and often point out the disadvantages of local common names, I admit that I have a hard time remembering any but the most often used ones. So on site, I often only identify the family the moth belongs to even though I have a clear image of a former encounter in my mind - usually of the the bugguide page that I have posted the species to. My age, the unusual American-English pronunciation of Latin-and-Greek-based words, and my copy-and-paste habit when I'm writing all contribute to the problem. A good field guide would help, but there isn't a western one. So I have begun to make my own spick sheets. 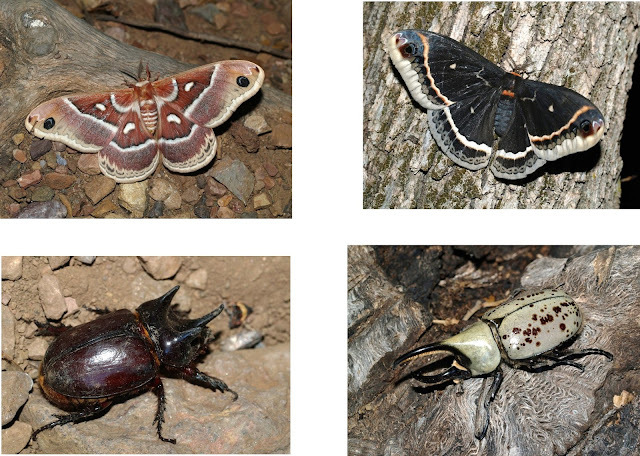 I am using the bugguide contributions for Arizona as my species list. After years of photographing at my black light, I have my own images of the majority of the species. For these three tables of Arctiinae I had to borrow 2 images each from Charles W. Melton and Randy Hardy, one each from Arlene Ripley, and Rich Hoyer. This spick sheet for myself can be considered fair use, but before I make any copies or other use of the pages I will have to ask them formally for their permission. Luckily all four great photographers and naturalists are good friends of mine.